Have you ever developed those pearly white bumps on your face that look like little cysts? Chances are they were milia. Babies as well as adults can develop these types of lesions. 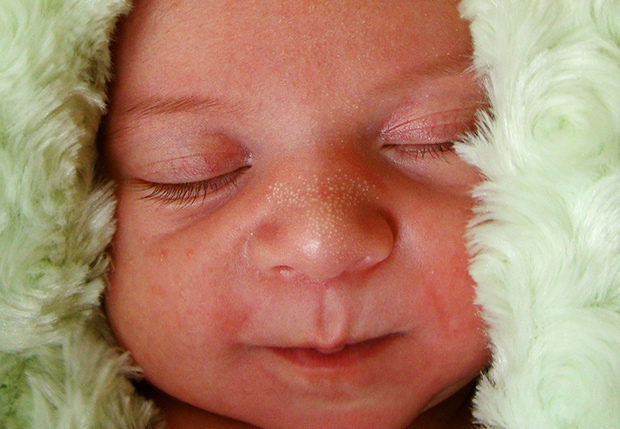 In newborns, milia can form over the cheeks, on the face and also inside the mouth (called Epstein’s pearls). They usually require no treatment and clear up on their own. In adults, they can develop anywhere on the body. If they do not disappear with general washing, help from a professional may be required for removal. So why do they form? So anything that results in accumulation of dead skin on the skin surface can give rise to milia. Another tip is to examine the products you are presently using. Be on the look out of products that are heavy on your skin like thick creams, serums, moisturizers and make-up which can contain pore clogging ingredients. Clogged pores hinder in the natural exfoliating process and can contribute to milia formation. I can recall many patients that came with white cysts right underneath the lower eyelids and after interviewing them, found out the culprit to be a new under eye cream! When all else fails after trying it out on your own for a couple of weeks, and your milia are not disappearing, schedule an appointment to see the dermatologist. He or she will likely open up the lesions and use a comedone extractor along with a little pressure to express the white colored material out. If you have many lesions, the doctor may have you come back for more vists and treat them each time. Having milia is not harmful. They’re more of a visual annoyance. Keep in mind young adults and teenagers may be more conscious of their physical appearance. Hence, having milia or any type of acne can affect their self-esteem. Parents can be proactive and help their kids develop a good cleansing regimen together so this doesn’t become an issue. Your best bet is to do what you can to avoid getting them!